This morning I was in Cornwall and this evening I bed down in Mid-Wales after an uneventful 4hr trip focusing more on the road signs than the scenery. I left early so that I might slot in some fishing time in the afternoon. All (or as you will see later, mostly) going according to plan. On this trip I started the day driving down narrow and leafy lanes, before negotiating the ubiquitous curse of British roadways, damnable and confusing mini roundabouts. Then onto duel carriage ways, then motorways, speeding along the M5 and M4, crossing the impressive span of the Severn Bridge and eventually ended up back in much the same sorts of narrow leafy lanes I had started with. Even then, each small town still sports at least one multiple mini roundabout, just to keep visiting drivers on their toes. I am currently working on the hypothesis that quality country living can be determined by the Mini roundabout/Country Pub ratio. As I ventured further into Wales the pubs were winning hands down, from my perspective a most cheering thought. There are some similarities between Cornwall and Wales. Both peoples Celtic and both fiercely proud of their heritage. 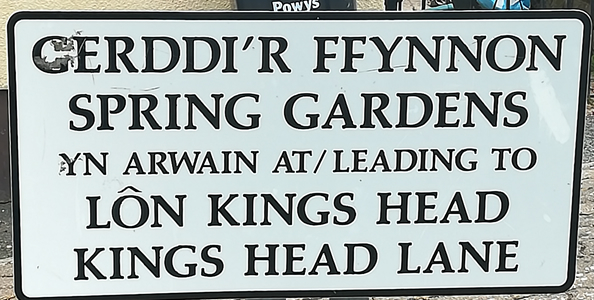 The Welsh have done a better job of preserving their language than have the Cornish , and each road sign requires a second take as directions are in both English and Welsh. If you wonder how to pronounce any of the names in the native tongue whilst driving, you are liable to lose concentration and come to a sticky end at the next mini-roundabout. 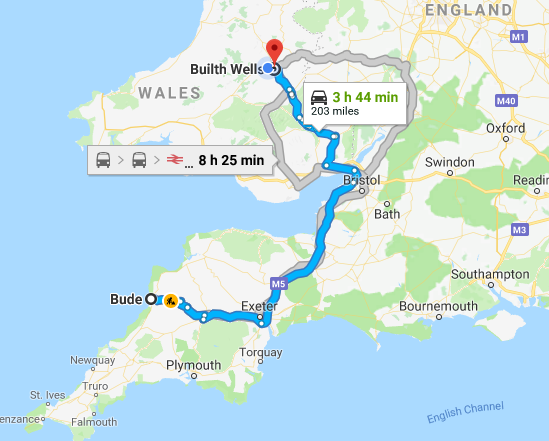 (As an example, my destination ” Pwllgwilym Cottages”, is apparently pronounced something like ‘Poff Gwillam”, meaning “Gwillam’s Pond” as best I can understand.) Having spent a good part of my life trying to get a grip on the Afrikaans “G”, I don’t see myself learning Welsh any time soon. Try reading this whilst whizzing around “Mini” Roundabout. It is self-evident that back in the mists of time the Romans never held sway over the Celtic nations, the complete lack of any sort of straight roadway being proof enough. The lanes wend and wind around a hotchpotch of apparently randomly shaped fields, ancient boundaries of farms and homesteads that have been in existence for hundreds of years. 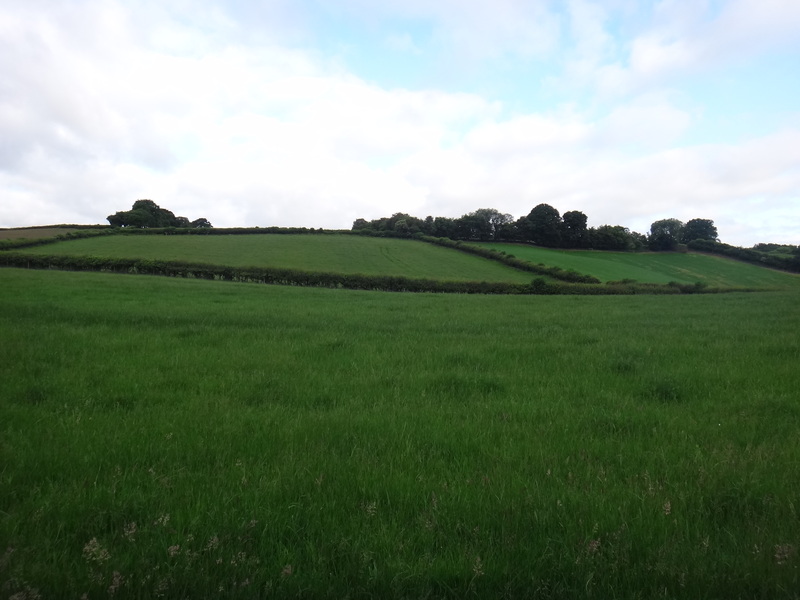 In Cornwall many of the boundaries would be demarcated with dry stone walls, whilst in Wales profligate hedgerows serve to mark out territory and of course keep the sheep where they are supposed to be (Sheep rarely stay where they are supposed to be even then)..
Green Fields and prolific hedgerows. I drove along these tiny country lanes marveling at the scenery and the lovely natural stone cottages along the way, the greenery is only broken by the white dots of wandering sheep, it is too beautiful for words, enough so that even the drizzle failed to curb my enthusiasm. Even the next mishap didn’t really deter me too greatly. Now for the “hiccup”: (Fishing trips, like Weddings, always seem to include at least on hiccup). On every beat description of the Wye there are dire warnings that you MUST have studded and felt soled boots and I purchased some from Sportfish specifically for the trip, couriered overnight to Cornwall.. I don’t like or use studded boots at home, but the warnings were so dire (capitalized and in parenthesis) that I had decided it would be foolhardy to ignore them. Not good and I was faced with the choice of risking life and limb wading in my shoes or skipping the fishing. I had already glimpsed sections of the Wye and there was no way I could delay wetting a line, so risking life and limb was really the only choice. 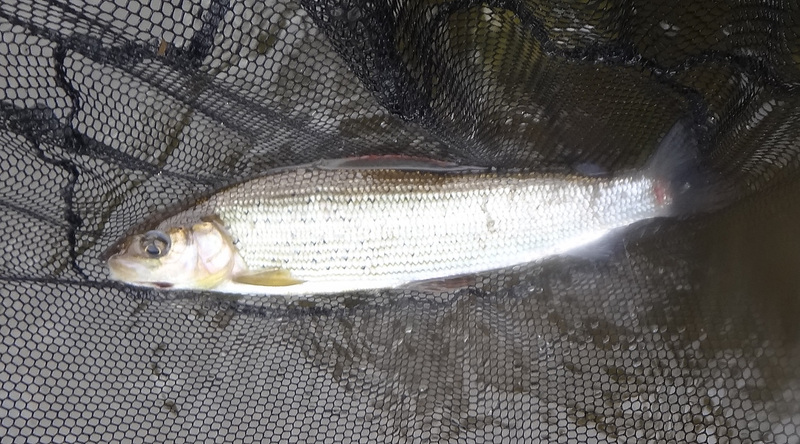 I did battle to wade and wasn’t able to fish the way I normally would, but that notwithstanding, I did manage to catch about a dozen grayling (the goal of the trip in many ways). In fact I got one of close to 2lbs I would think, and I was well pleased with that. They are tremendously pretty fish with bright red fringes on the massive dorsal fin which they use like a sail when fighting in the current. Gorgeous looking fish, and alas I shall have to delay posting this because on top of the boot saga the camera went on the blink and I was unable to take a picture. I shall hope to do so shortly, but of course we all know that when the camera is working the fish won’t be biting. I can only promise to do my best when the opportunity arises and if all else fails I shall have to take the cell phone with me on the water.. Finally a picture of a grayling. The Latin name is Thymallus thymallus because they supposedly smell like the herb. Had the originator been trying to photograph them instead of sniffing them they would have been called “Slippery slippery”.. I shall have a day more on the water without the correct footwear, but the family have already been instructed to courier them up to me (Hang the expense) because I need them badly. Tomorrow I shall be on another beat and will no doubt be staggering about or trying to fish the runs from the bank, not ideal but with good fortune the boots should arrive by Tuesday morning and then I will be good to go. An interesting aside though, forced to fish without the prerequisite boots and the mobility that goes with them I had to adapt. Firstly very little Euro-nymphing because it was not easy to wade deep enough for that. Secondly , because I was frequently out of position I was required to do a lot more mending of the line and curve casting than I might otherwise employ. In the end I suppose it was an exercise which is of value, no matter that it was born of error and frustration. Back home anglers and clients who find it difficult to wade make the same errors, trying to fish from the same position instead of moving to get better angles and more control. Today I felt for those anglers , because I had become one of them, being forced to make difficult presentations where a move to a different location in the river would have made things simple, the ability to move and choose the best position for each presentation is a skill well worth learning and the troublesome footwear forced upon me highlighted that point with glaring clarity. Tomorrow will be more of the same no doubt, but at least that first rush of overly hurried preparation and excitement will have abated and I should proceed with more focus and at a more leisurely pace on day two. For now it is time for some pub grub, a pint of ale and a restful sleep in the absolute quiet of the Welsh hills. I shall have sweet dreams I am sure, (probably interspersed with short nightmares about missing boots).